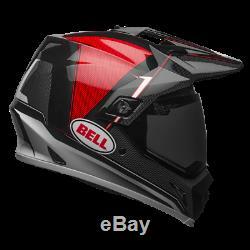 Bell MX-9 Adventure MIPS Berm Black & Red Motorcycle Helmet. The Bell MX-9 Adventure MIPS helmet is a high specification dual sport model. The Bell MX-9 Adventure MIPS helmet features a lightweight polymer composite shell it can be used with or without the integrated visor and includes a moisture wicking removable and washable air channeled comfort liner a padded chin strap with D-ring closure and strap keeper. The Bell MX-9 Adventure MIPS motorcycle helmet features a Multi-directional Impact Protection System which is a leading slip-plane technology inside the helmet designed to reduce rotational forces that can result from certain impacts. The Bell MX-9 Adventure MIPS helmet is packed with features and is a great all round dual sport helmet package at an extremely modest price. Supplied with: - Clear visor fitted - Bell helmet.. The Bell MX-9 Adventure MIPS helmet features a lightweight polymer composite shell, it can be used with or without the integrated visor and includes a moisture wicking, removable and washable air channeled comfort liner, a padded chin strap with D-ring closure and strap keeper. The Bell MX-9 Adventure MIPS motorcycle helmet features a Multi-directional Impact Protection System, which is a leading slip-plane technology inside the helmet designed to reduce rotational forces that can result from certain impacts. These Bell MX-9 Adventure MIPS are supplied with a clear visor fitted as standard, the image shows a tinted visor but this is for display purposes only. AGV K3-SV Pinlock anti fog Insert. Objet bien reçu conforme à l'annonce Envoi très rapide Merci. LS2 FF368, FF369, FF370 Pinlock Insert Lens Choice of colours. AGV K3-SV Bulega Motorcycle Helmet. TomTom Rider 550 Premium Motorcycle GPS SatNav Lifetime World Maps +Speed Camera. You will be responsible for the costs of returning the goods to us unless we have delivered the item to you in error or the item is faulty. Our number one goal is to provide you with the best service for the lowest price. Mistakes and errors do occur, and we promise we will make every reasonable effort to correct the problem. Your cooperation is greatly appreciated. Saleable Condition - Items must be in same condition as they were sent. This includes packaging, bags, documentation protective films etc. If this is not the case The Helmet Shop may charge for repackaging or refuse the accept the return. Important Notice for all buyers outside the UK or European Union. Bell Custom 500 Deluxe RSD Check It Motorcycle Helmet. Bell MX-9 Adventure MIPS Matte Black Motorcycle Helmet. Bell Qualifier Impulse Black Motorcycle Helmet. Bell MX-9 Adventure MIPS Torch Orange & Black Motorcycle Helmet. We are one of the most established and longest serving motorcycle accessory online retailers. Originally set up to retail motorcycle helmet visors, we have over the years added helmets, helmet parts, clothing and accessories to our range. We are a full bricks and mortar business based at Duques Motorcycles which is the largest motorcycle dealership in the Channel Islands and who are official Yamaha & Suzuki UK dealers. The item "Bell MX-9 Adventure MIPS Berm Black & Red Motorcycle Helmet" is in sale since Tuesday, May 8, 2018. This item is in the category "Vehicle Parts & Accessories\Clothing, Helmets & Protection\Helmets & Headwear\Helmets". The seller is "helmet_shop" and is located in Forest.